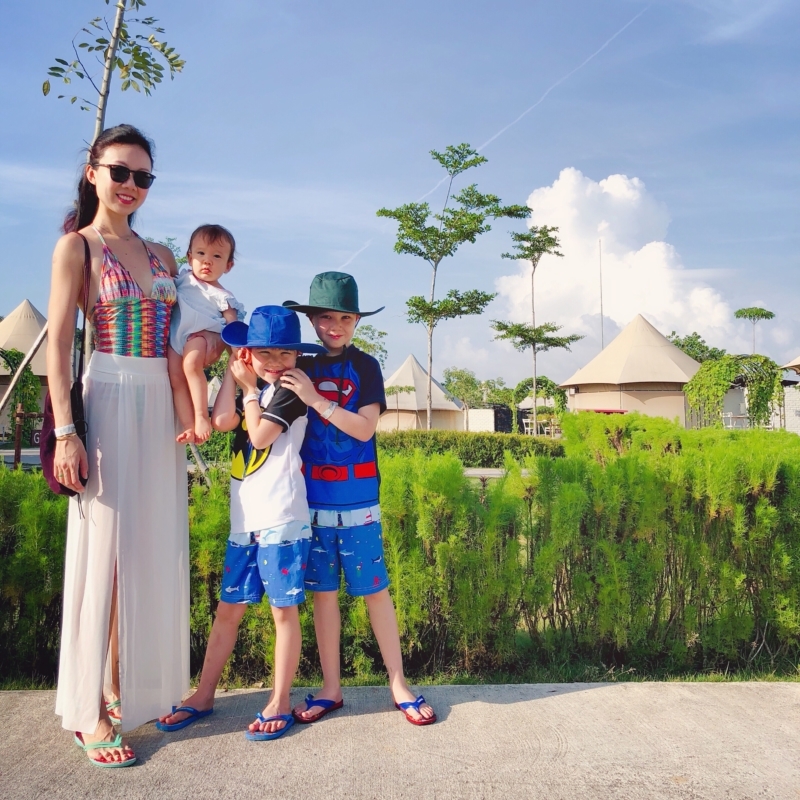 BINTAN’S CANOPI RESORT FOR A YOUNG FAMILY | Beverly's Net: family. food. fashion. 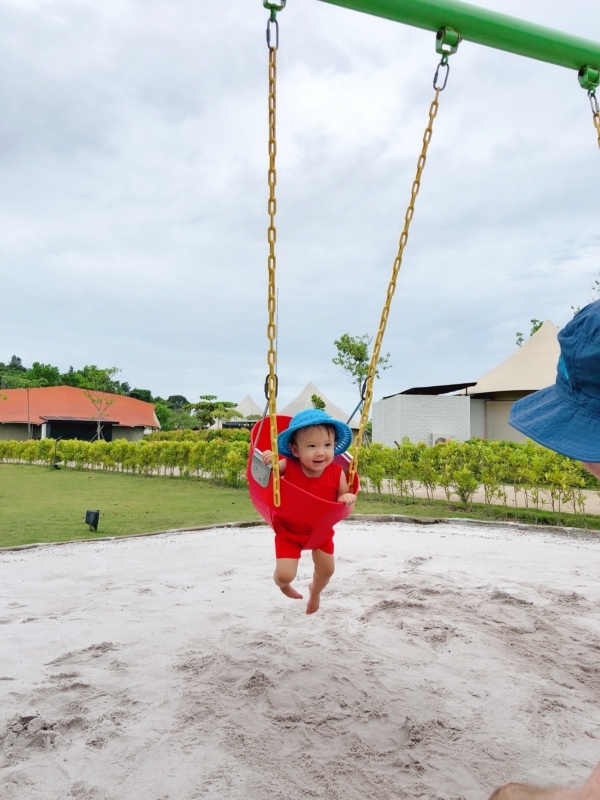 BINTAN’S CANOPI RESORT FOR A YOUNG FAMILY – Beverly's Net: family. food. fashion. 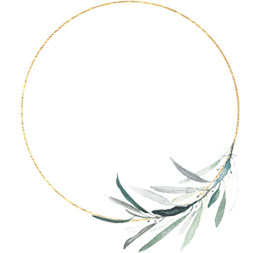 COST – flying to a destination costs us several thousand bucks, which makes me cringe because often, we can only afford a handful of days to getaway. And, in my opinion, I only want to pay that kind of $$ if we are away for 2 weeks. LOGISTICS – it’s just no fun travelling for hours with young kids. 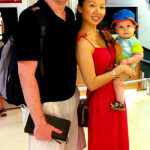 No matter how good a traveller they are (and the 2 boys are excellent travellers), it’s still zero fun. It’s a pain packing activities, it’s a hassle organising everyone is sorted and seated, and it’s awful shuttling them one by one to the bathroom every so often. This means I WAY prefer close-by getaways… they just make sense! We have a few days to spare, we don’t want to blow the big bucks, yet we want the kids to have an amazing time. 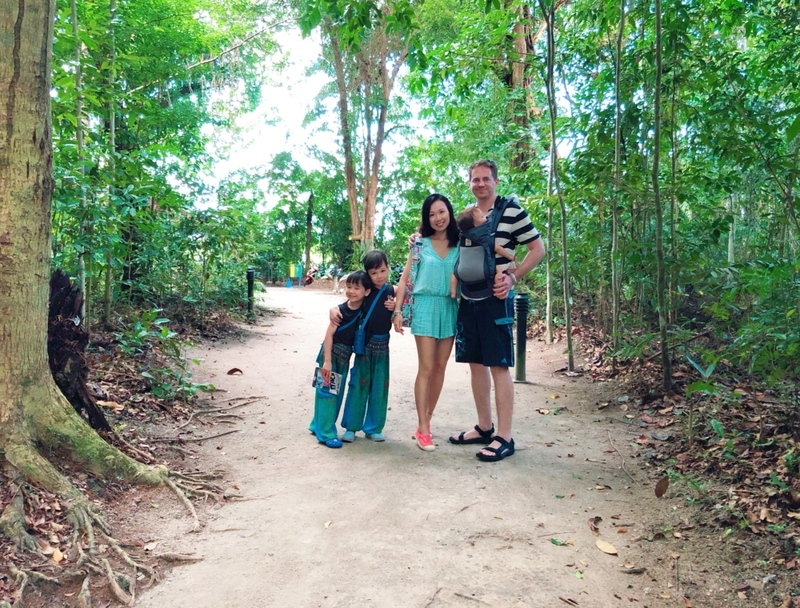 So Bintan’s “The Canopi” was pretty much the perfect choice for us. But, before I get into it, let me be really clear – The Canopi is not camping. It’s not even glamping. But people love to call it “glamping”, though it literally is a stand-alone hotel room with a canvas tent stretched over it. This also means it’s pretty awesome for people that get squeamish at the thought of roughing it out.. because The Canopi is basically one giant hotel room! The tent fit a large bed for the adults, 2 single-sized beds for the boys, and a baby cot (next to our bed). WITH ROOM TO SPARE! Outdoor bathroom which was really lovely. 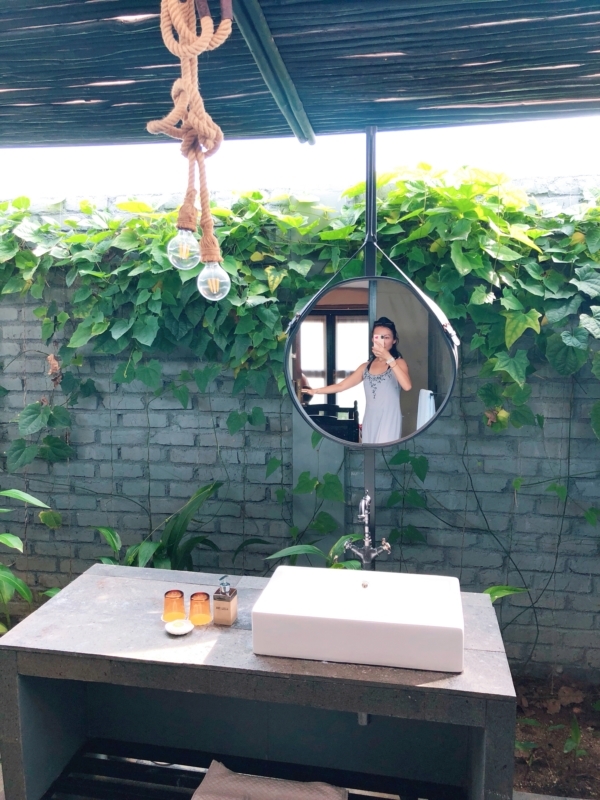 I’m a huge fan of outdoor bathrooms with rain showers, so this check marked it. The stand-alone tents are pretty spaced out from each other, as you’ll see in the photo above. Our little cluster of tents had a swing set (some have a mini play ground) outside, which the boys really liked. 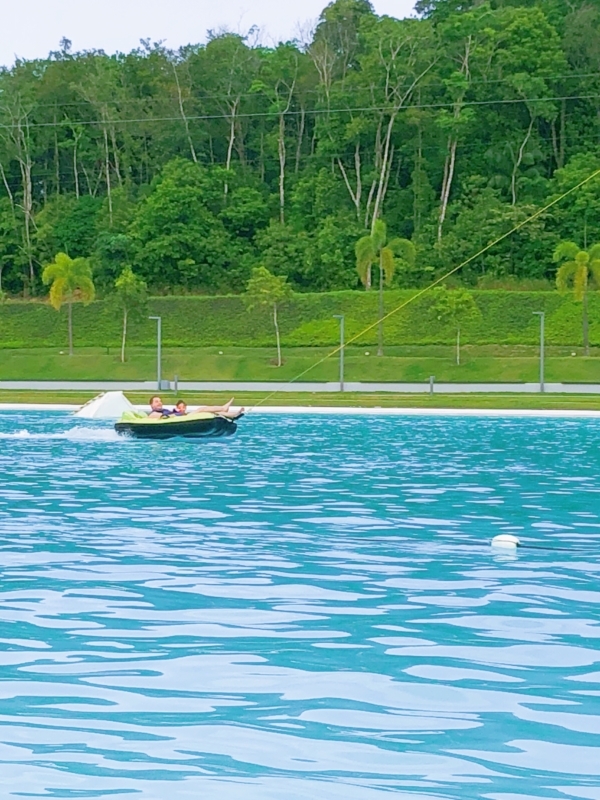 It’s a man-made saltwater lagoon and perfect if you’re the type that doesn’t like murky sea water with random bits of seaweed (and other gross things) floating around in it. The edge is super shallow and fab for lil kids to wade around in, but it goes really deep in the middle, for water activities. This looked amazing! My jock-child Carter went on it, of course. It’s a large inflatable float that is pulled at top-speed back and forth along a zip line. I’ll be honest – my heart was in my throat watching them. NOT for the faint hearted and I wouldn’t recommend it for kids tbh! Though my jock-child loved it. Cute mini ATVs for the kids, which they can either ride in small circles in the immediate area, or around the huge lagoon. I thought they were awesome, and so nice and safe. But they are a bit slow (for my boys, anyway) so they weren’t very keen..
Now THIS they absolutely adored. 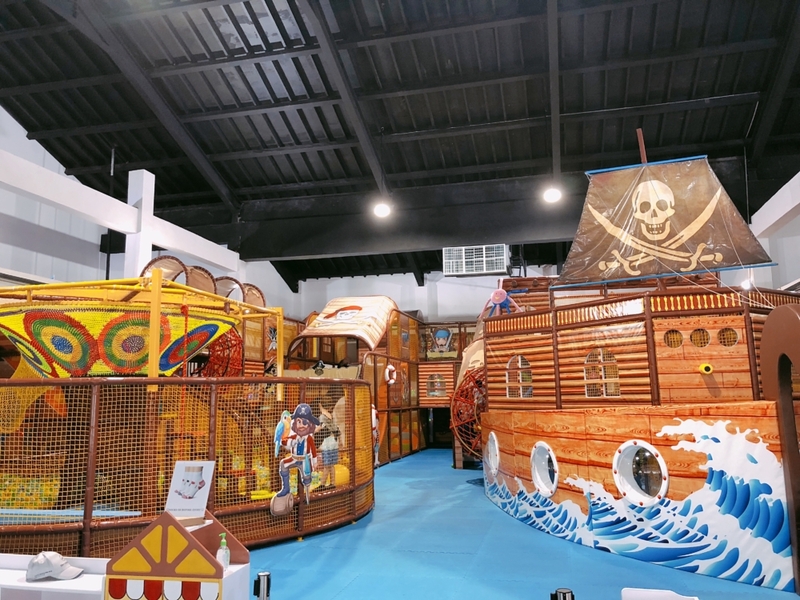 The huge Pirate Playground, which was so clean, well-maintained, and – best of all – almost empty! It’s so nice and cool inside, which gives reprieve in the middle of the day when the sun is blazing outside (there is almost zero shade in the lagoon) and you need somewhere cool to hide. A baby swing, with super fine sand. Right at the breakfast restaurant area! The Canopi’s restaurants are pretty dull TBH. The food is decent, but think Singapore restaurant prices. 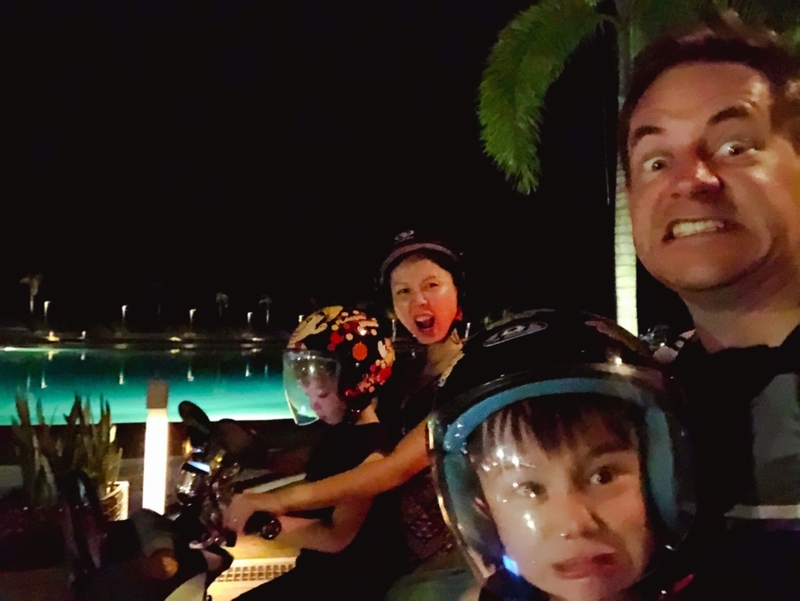 We ventured opposite the lagoon (going in the motorized buggy, much to all 3 kids’ delight!) to Treasure Bay and they have little market stalls there during the day time…. with AWESOME hawker food, at super cheap prices! I loved this grilled squid dish (above), and their fried instant noodles is totally addictive. And their Ramly burger? OMG.. let’s just say we had multiples of that. Even the kids enjoyed it, and my boys don’t like burgers! 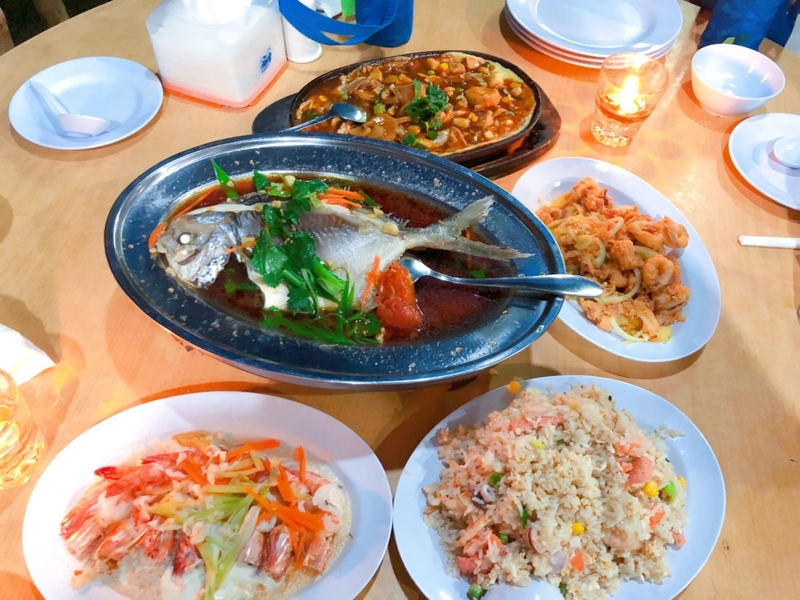 We did the touristy thing and went on a boat ride to a seafood restaurant. But first, a quick little trek through the forest at dusk! 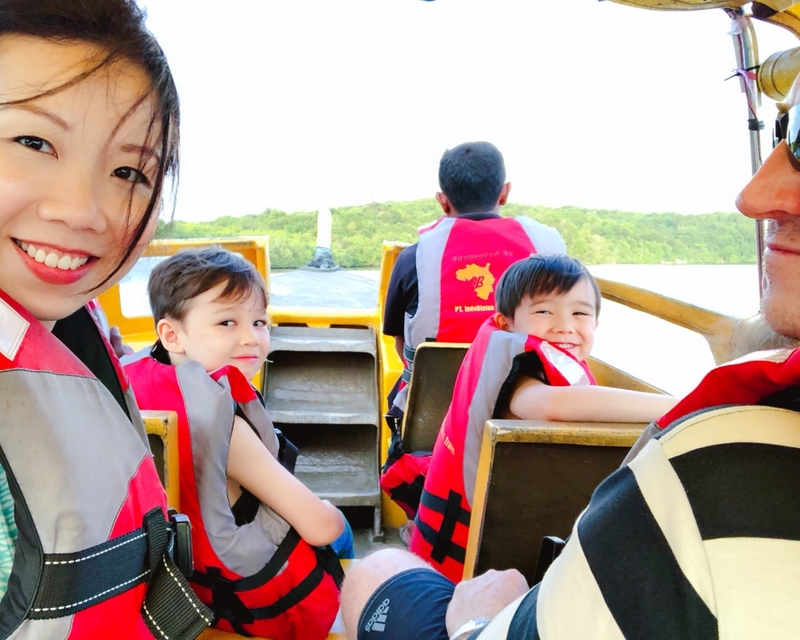 The kids had so much fun on the boat ride, with the wind in our hair, and sailing down the river. The boat doesn’t go very fast, and we all have life jackets, so I felt really safe. All three kids destroyed the food. Even Chloe, who had only just started on solids but was so greedy she screamed and fussed until she got our table food. 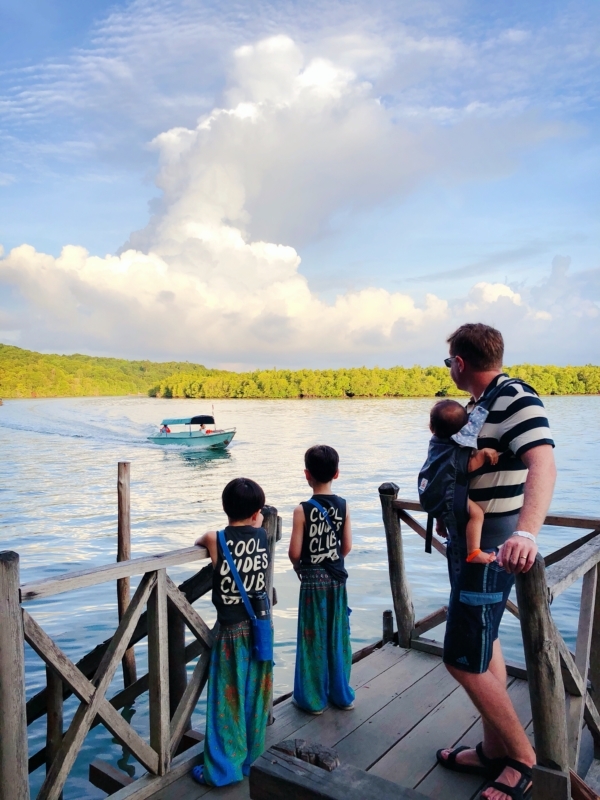 The price was way cheaper than Singapore seafood restaurants, and the kids got a big kick out of sitting above the water and watching the sunset. 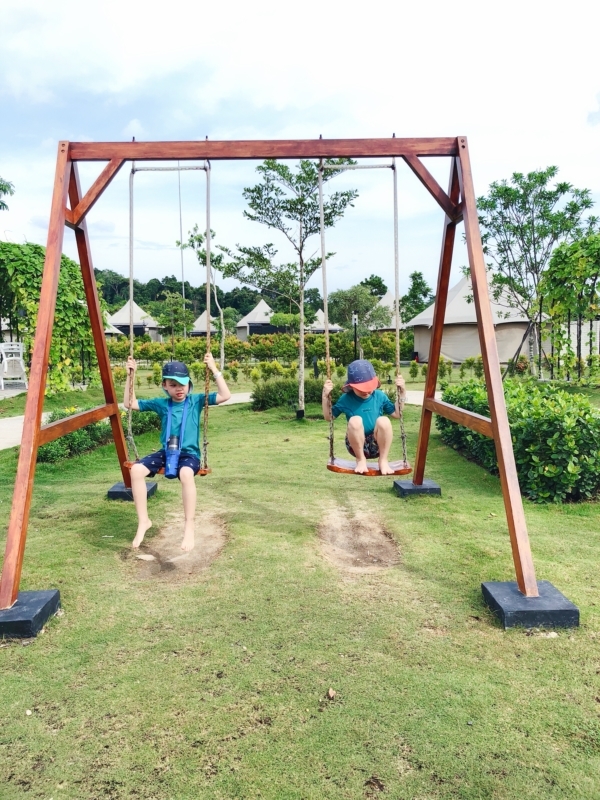 Bintan’s “The Canopi” is a seriously good option for families with kids. There’s a lot to do, it’s so close from Singapore (and doesn’t require a flight to get there), and is just a whole lot of fun. The boys have such fond memories they’ve asked Chris and I to promise to bring them back once every year!